Nordstrom has finally rolled out doors in Canada's major cities. We are so excited to welcome two locations here in Toronto - one downtown at the Eaton Center and another in Yorkdale Mall. Not only does Nordstrom bring highlight pieces from runway designers that have previously not been available in Canada, but they also offer unique styles from popular designers, such as Alexander Wang and Helmut Lang, which are available nowhere else. Some of my favorite collections in the store include Delpozo, Self-Portrait, McQ and Simone Rocha. It will be very interesting to see how Nordstrom's arrival will impact the Canadian marketplace! Our "LA in the Fall" Event. 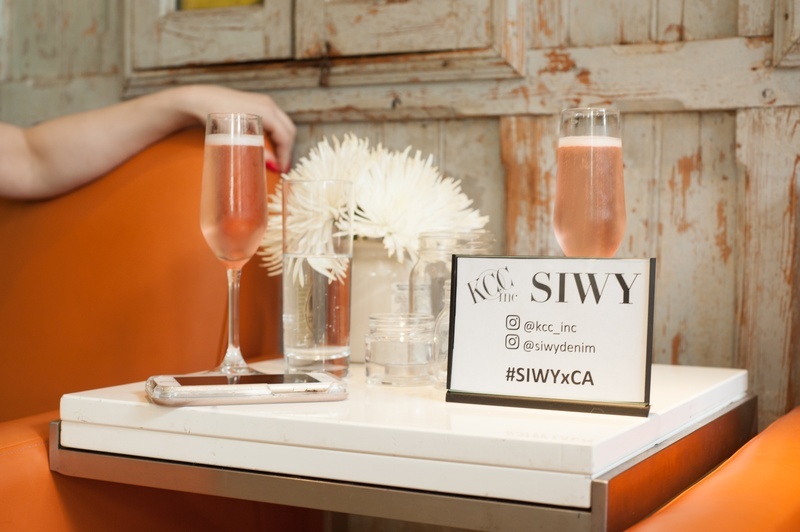 Last week, we hosted our exlusive "LA in the Fall" launch event for Siwy Denim and it was incredible! In addition to kicking off our Fall line with the Canadian press, we also introduced our full seamless line and the response has been insane. The event was produced by Liquid Communications at Wish Restaurant in Yorkville. Big thanks to the entire team which includes photographer Jonathan Hooper, Lancome makeup artist and creative director Myles Sexton, DJ Lokei and Liquid Comm's fearless leader Amanda Lao who created an incredible experience for our guests. Guests included Elle Canada, Fashion Magazine, Yahoo! Canada Fashion and Entertainment Tonight Canada. Entertainment included our dreamcatcher station, selfie stations complete with a custom snapchat filter, and a gifting booth featuring amazing products from Siwy and from our jewelry brand, Ellie Vail. We're thrilled to announce that the KCC now distributes Ellie Vail Jewelry in Canada! The collection is all about minimal styles for every day. Prices range from $35-$95 CDN retail, with the majority of the collection retailing under $75 CDN. Ellie Vail Jewelry was founded in 2014 after former celebrity stylist Ellie Vail took an impromptu jewelry making class and realized that designing jewelry not only came naturally to her, but was something she enjoyed and was good at. Having previously styled the likes of Sofia Vergara, Celine Dion, and even the Kennedy Family, Ellie Vail understands the importance that accessories play in the wardrobe department. Ellie describes herself as a "creative DIY" type woman, so her appreciation for accessories and more specifically jewelry can be seen in all of her designs. Ellie Vail Jewelry is designed for the everyday girl. Her collection is a mix of minimal and edgy pieces combined with the latest must-have trends. her goal is to keep the line affordable for everyone. Ellie Vail Jewelry is designed so that if you love it, you can have it. I cannot get enough of Siwy's new seamless line - the fit is just incredible. They're the perfect 24 hour jeans which offer ease and comfort while remaining very polished and chic aesthetically. The seamless experience is designed to give the ultimate performance potential in denim without sacrificing style. By removing the side seams, Siwy has accomplished something special - a jean that feels like second skin. Innovative, buttery-soft and super-stretch fabrics allow for 360 degree flexibility. They're a wardrobe staple for busy working women. Toronto Fashion Week recently wrapped up and we had the privilege of dressing some of Toronto's top Street Style Stars in Viparo. Here is a peek at some of my personal favorite looks! Kara Ross at the StyleLab Lounge at the Canadian Screen Awards. With the Canadian Screen Awards coming up on Sunday, the KCC is thrilled that Kara Ross Handbags will be a part of DivineLab's Stylelab Red Carpet Lounge. A selection of Kara's most red-carpet worthy clutches will be available for rent for the night. We look forward to being a part of the Academy of Canadian Cinema and Television's big night!